is the international scientific journal, published by the Faculty of Economics and Management, Slovak Agricultural University in Nitra, Slovakia and the Association of Agricultural Economists in Slovakia. The RAAE provides a forum for scholarly work in agricultural economics; rural and regional development; development economics; food policy; management, marketing, finance in agriculture and food processing. The RAAE is a scholarly open access, double blind peer-reviewed international journal published electronically twice a year. The RAAE welcomes the submission of manuscripts that meet the general criteria of significance and scientific excellence. Research articles are freely available immediately on publication with no charges to authors or readers. Each paper will carry a digital object identifier (DOI). 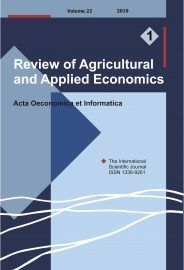 Review of Agricultural and Applied Economics by http://www.roaae.org is licensed under a Creative Commons Attribution 4.0 International License. We follow Sherpa/Romeo‘s blue archiving policy. Post-print or publisher’s version/PDF is archived, without restrictions.The RAAE has been under review for indexing/tracking/covering by other research databases and services.